When Do vSphere MoRef’s Change? You are here: Home / When Do vSphere MoRef’s Change? I received a few follow-up questions from my earlier article vSphere MoRef (Managed Object Reference) ID Finder Script regarding when the MoRef (Managed Object Reference) ID changes. As mentioned in my previous article, a MoRef ID is guaranteed to be unique within a vCenter instance to track all entities such as virtual machines, hosts, datacenters, resource pools, etc. and this is stored within the vCenter Database. One thing that I did not mention in the other article, is there is also a MoRef ID for objects that reside directly on an ESX(i) host. The scope of a MoRef ID on an ESX(i) host is only within the host itself, this is another reason why it is a best practice to use vCenter to not only manage your inventory but also keeping track of a single consistent global MoRef ID. An entities MoRef ID will remain the same throughout it's lifespan unless it is destroyed or unregistered from vCenter Server (e.g. virtual machine or host). With a MoRef ID on an ESX(i) host, this will slightly change with vSphere operations such as vMotion and/or Storage vMotion of a virtual machine in which the VM will be unregistered and re-registered on a completely different host. As you can see, the vCenter MoRef ID stays the same during the vMotion, but the MoRef ID on the hosts will change as the VM changes hosts. With Storage vMotion, the vCenter MoRef ID stays the same as one would expect, but the MoRef ID on the hosts still changes because start with vSphere 4.x, a Storage vMotion starts off just like a vMotion and hence a new VM entity is registered on the same host. Since vCenter is creating a new VM entity, a new MoRef ID will be generated as expected. Just like with a clone, an FT'ed VM will contain two unique entities on each local ESX(i) host and hence a different MoRef ID will be found, but still only a single MoRef ID in vCenter. Again, since the entity was destroyed and re-created with the same name, it is treated as a new object and hence a new MoRef ID will be assigned to the entity, even if it has the same name. This is true if you remove an ESX(i) host from vCenter and re-add it, all information including the MoRef will be re-generated. Lastly, you might ask if one could modify or set a MoRef ID for an entity in vCenter since it is stored in the vCenter Database? The answer is no. The MoRef ID is stored in the vCenter Database but there are many internal pointers that uses the MoRef ID, especially when it comes to VM MoRef IDs. Just updating the ID in one location will not suffice and can cause integrity issues with your vCenter Database, not to mention it is not supported by VMware. However, there is one way you could influence the algorithm on how the MoRef ID's are generated. Within vCenter, there is a instance ID property that is generated during the installation of vCenter Server which ranges from 0 to 63. This value can manually be adjusted as it is also used to uniquely generate VM Mac Addresses and UUID's as described in this VMware KB. Restoring a datastore from a snapshot. Although the snapshot is the same datastore, technically it's a new LUN with a unique signature. VMs restored at a DR site, especially when using 3rd party replication tools. Hosts that have been removed from inventory and re-registered with the same vCenter server. – Restoring a datastore from a snapshot. Although the snapshot is the same datastore, technically it’s a new LUN with a unique signature. – VMs restored at a DR site, especially when using 3rd party replication tools. 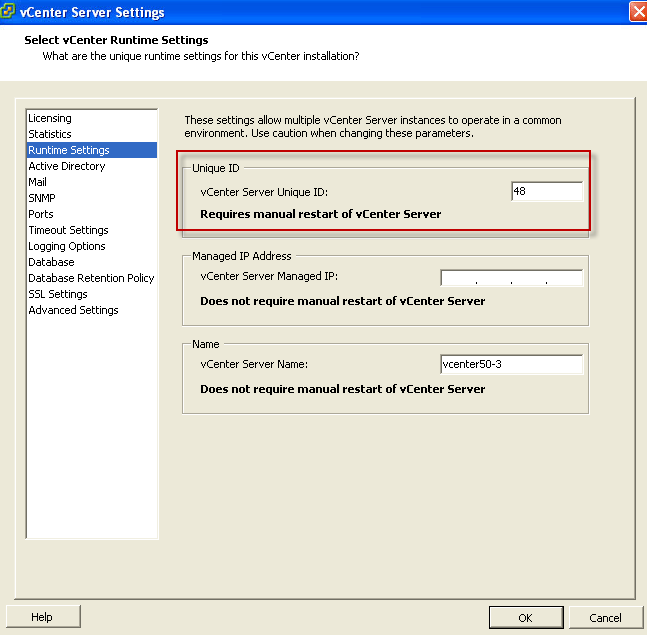 – Hosts that have been removed from inventory and re-registered with the same vCenter server. Thanks for the feedback David, I’ll go ahead and include these as additional scenarios. Is there a way (may be PowerCli or esxcli or something else) to ask vCenter to regenerate MoRef ID for particular object without recreate it (delete-new way) ? No, there’s not. MoRef generation is done through vCenter Server or ESXi automatically as new inventory objects are added. For a VM, you could un-register and re-register to force a new MoRef but for other objects, there’s no such thing as un-register. What exactly is the use case for this since MoRef is a unique ID for VC to keep track of it’s inventory. By unpresenting lun to esx and presenting back again, will MoReFId change in case of empty datastore (No VM in)? is there any way to tell VC the start giving moref from a defined number. No, MoRef generation is all automatically handled by VC and you have no control. Not sure I understand what the concern is? Its simply an ID for VC to ensure uniqueness and if you’re not migrating the VM or removing it from inventory, the MoRef ID will be persistent until its removed. at this point we have an issue , we have an exiting protection group that has a moref on vm that is not exists. to keep our protection group valid we want to keep recognizing this vm. considering moref are unique everything works fine. problem is what we should do when a “real” vm with moref vm-100 will be created ? this is why we thought to find a way to tell VC to set the moref count to 100. Hi William, Does vCenter know what the moRef is relative to the ESXi host or is the only way to get this to query the host itself? At the moment, I connect to vCenter and run $vm = Get-VM myVM which allows me to to find the VMhost under $vm.VMhost.name. I then I have to run Connect-VIServer -Server $vm.VMhost.name, followed by $vm = Get-VM -Name -$vm -Server $vm.VMhost.name. Then the moRef relative to the ESXi host is $vm.id.substring(15). Is there any way to get that from vCenter? Hi William, thanks for your reply. I’m interested in the moRef relative to the ESXi host in order to view the console via HTTP. i.e. https://$($vm.VMHost)/screen?id=$moRef will show me the console. This doesn’t work if I run it against vCenter.